So The Amazing Spider-Man has finally reached its 600th issue and to commemorate the occasion, this issue came with four variant covers, I chose the Alex Ross (if I’m not mistaken) variant for my article as it’s by far my favourite. I don’t really follow the Spidey comics as, like most of the mainstream characters of the big boy publishers, there’s simply too many different titles, reboots, retcon and so forth that I couldn’t be bothered to make an attempt at following them. 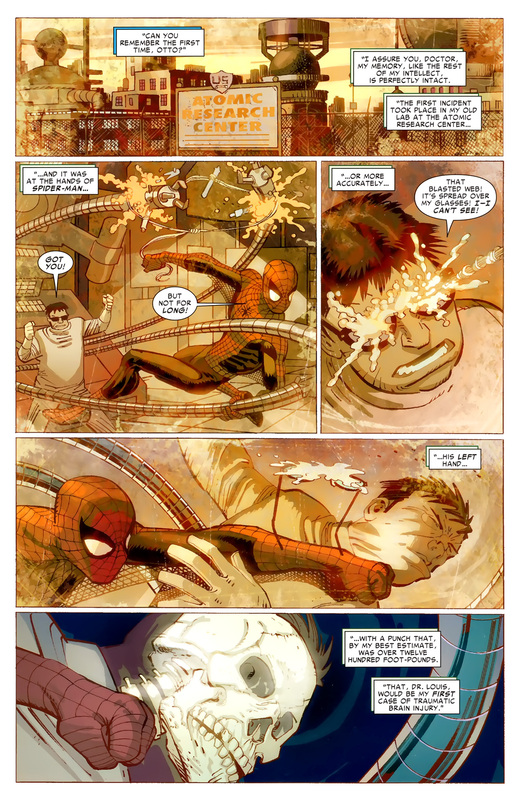 The 600th issue consists of various tales, the main story consisting of 59 pages and focuses on an ailing Doctor Octopus, who after years of receiving continuous beatings from superhero and villain alike, has been left with collective blunt force trauma damage, leaving Otto with a shortened lifespan. In light of this, the ‘good’ doctor decides to make the most of the remainder of his life by ‘making amends’ and leaving the world his legacy – a perfect global utopia. Though the doctor’s heart is in the right place, his methods are questionable and soon enough he has the attention of our friendly neighborhood Spider-Man, The Avengers and The Fantastic 4. Apart from the central story, there are four ‘Amazing Spider-Man covers you’ll never see‘ which are pretty damn funny (most notably the hippie variant) as well as several short tales including Spidey going to a shrink due to an identity crisis/nervous breakdown whereby he tries to explain all the events in his life ranging from the black symbiotic suit, Green Goblin being dead, only to rise from the grave and even Parker’s transformation into the man-spider. The story harks back to what I said earlier in regards to the Spider-Man series as being incomprehensible with constant reboots and what not (much like the X-Men series; with what seems like fifty million titles), a tangled web indeed (if you’ll excuse the pun) and I think the ‘Identity Crisis’ story pokes fun at the fact that trying to keep track of all the events, changes and story-arcs in the Spidey universe would drive anyone mad. John Romita, Jr is responsible for the artwork in the central story, his work is very clean consisting of a strong angular drawing style but I'm sure by now most comics-book fans are accustomed to his work. Spider-Man first appeared in Amazing Fantasy #15 back in 1962, I wonder if Stan Lee ever thought that his creation would still be as popular as it is thirty-seven years later. Three films (4th due 2011), animated shows, action figures and a myriad of other merchandise is testament to Spidey’s popularity. For some reason I assumed issue six hundred would be a self-contained story, sadly it isn’t so the ending kind of left me confused with Mary Jane showing up, which seems to be a big deal judging from Peter and Aunt May’s expressions. Anyway, as most Spider-Man issues, this edition is action-packed and sure to please Spidey fanboys, though Planet of the Symbiotes (circa 1995) is still my favourite Spider-Man arc. The year 1995 was a great one for Marvel what with their Age of Apocalypse series (X-Men) and official distribution of ongoing comic-book titles in South Africa. If you’ve got five bucks to spare and you’re a Spidey fan, you can’t go wrong with The Amazing Spider-Man #600. In fact, perhaps you should purchase two copies, one to read and another for storage (sure to be valuable in the years to come). On another note, a belated happy birthday to Stan Lee (born 28 December 1922), comic-book pioneer. Excelsior! This entry was posted in Comics and tagged comic-books, doctor octopus, john romita. jr, marvel comics, spider-man, stan lee. Bookmark the permalink.